We will PREPARE FOR THE HURRICANES…. Honorable Shamans and Fellow Pagans, Hurricane Season is coming, and we will have a Ceremony at 12:15 pm (local time) on August 5th, 2018. This will be held at the Unitarian Universalist Church of Fort Myers, Florida. Feel free to join us, where ever you are in our ceremony. Here is what we will be doing. Our sacred space will be in a screened porch. We have a central altar table, and lots of chairs. Sit where you like. The Altar will be covered with a blue plastic tarp which will be anchored with duct tape. Under the tarp, there will be ceremonial objects, of course, like candles, feathers, water, rocks, statuary to honor dieties, and, gifts to honor our local totem Animsls: Wild Turkey, American Alligator, The Manatee, and, the Florida Panther, as well as relics to honor our Ancestors. But there will also be objects at each of the four directions, related to Hurricane Planning: communications devices, road maps, lighting devices, water containers, gas cans, the local evacuation shelter guide books, canned food, and many other items that people should have as they go into Hurricane Season. We’ll sing songs, rattle to raise energy, greet the Elements, Animals, Ancestors. Then, we will talk about what the animals and plants do, before/during/after a Hurricane, and, talk about the Spiritual lessons of Hurricane Season, which are many. Faith beats Fear. Then, we will take a Shamanic journey to work with the energies and connect to our Guides. After that, we will talk a bit, ground ourselves, thank and return the Invited Ones, and close the Ceremony. Then we will eat. Please bring a covered dish to share. Also, please bring your own water to drink. After the Ceremony, Whale Maiden will be on hand to tell *humorous* stories of “The Great Evacuation Road Trip for Hurricane Irma (2017), ” and other hero’s journeys. This event is sponsored by CUUPS of Fort Myers. (c) 2018 to present, Whale Maiden for the Earthways Shamanic Path. All rights reserved. There’s an alligator at the southeast corner of my back yard, Honorable Shamans and Fellow Pagans. It is six feet long, vivid green, and made of pool plastic. It either blew over from next door, or my next door neighbors placed it on my yard. Either way, I see it as a protector of sacred space. When building sacred space in the Earthways Shamanic Path, we work with the Four Directions, and with Animals native to our part of the world. What are the sacred Animals, where you live? To whom do you sing? Here in Southwest Florida, I start by signing to the fishes and the manatee and dolphins and of course, to the Whales in the WEST. West represents Water and emotions. We are surrounded by water here, and as I am writing this it has started to rain. The birds fly through the air over the waters, and they see the fishes. The song continues as the Pelicans and Ibis, Herons and Gulls fly all around. We depend upon the Air, and it represents the EAST, and our thoughts. In the swamps and sloughs to the SOUTH, dwell the creepy crawlies: Dragonflies, butterflies and moths are plentiful here, as are alligators. The South represents Fire and passion, and protection. 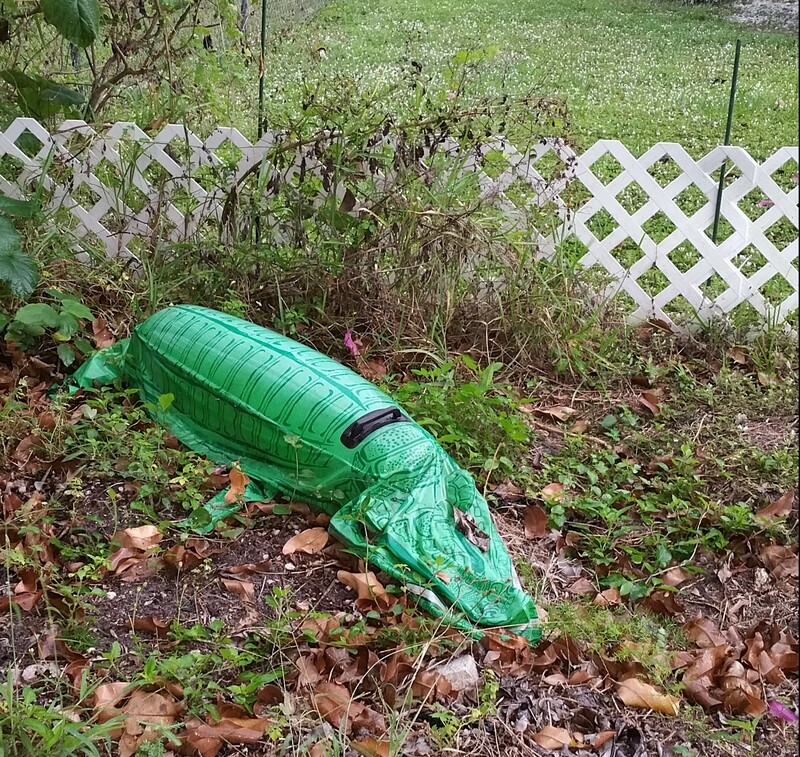 Thus, it makes perfect sense to me, that I have an alligator resting in this corner of my yard. The four leggeds root around in the swamps and sloughs and all the Earth here, connected to the ground — our Mother Earth — the NORTH, and take daily right action to continue their life cycles. Our Florida Panther, and the Florida Black Bear are sacred here. Which Animals form the sacred space where you live? What steps can you take to connect with the Sacred Animals, all around you? Although the Earthways Shamanic Path is based in Florida, it can be celebrated anywhere. You just need to explore the magic of your land. What is it saying to you? What are the seasons, where you live? What do they mean to you? How are they celebrated? (c) 2015, Whale Maiden. All Rights Reserved. Whale Maiden-Suburban Shaman Create a free website or blog at WordPress.com.